She was born with her eyes closed and a word on her tongue, a word she could not taste. Her name was Anidori-Kiladra Talianna Isilee, Crown Princess of Kildenree, and she spent the first years of her life listening to her aunt’s stories and learning the language of the birds, especially the swans. And when she was older, she watched as a colt was born, and she heard the first word on his tongue, his name, Falada. Oh how I love thee Shannon Hale. You never disappoint and always tell the best tales. 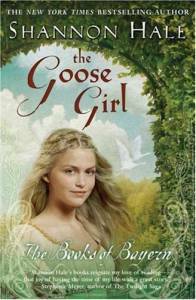 The Goose Girl is a re-telling of the Grimm's fairytale and it is awesome. I'm a sucker for a good fairytale, and Ani proves to be one of my favorite heroines to date. You must read this coming of age tale! I give it 2 thumbs up! My sister's Katie & Becca were after me forever to read this book. I've read it several times now, but decided to read it again as I just bought the rest of the series. There are 4 books of Bayern and I can't wait to find out more of the story! "They finished laughing and caught their breaths, and looked at each other, and Ani thought Geric looked at her too long, as though he forgot he was looking, as though he did not wish to do anything else. She looked back. Her took heart took its time quieting down." I enjoyed the whole series--but Goose Girl is definitely my favorite. I agree, too: Ani is one of my favorite characters. Ever. Oh wow. Great review. I really want to read these. I've only read one Shannon Hale so far. Loved your review...I've not red any of the series but you're making me reconsider. I loved this book too. I read it as a book on tape. I walked and worked in my garden as much as I could to hear more.